After an efficent morning chore period, we had a long discussion of our current scientific methods and how they need to be changed and improved. Jason also began to examine the OrcaMaster data set. 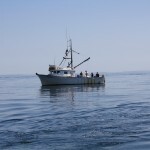 In the afternoon, we sank a Vemco receiver in front of Val’s house to pick up the pings from the salmon experiments. The Vemco was deployed at 14:45 at 48, 33.7 and 123, 10.81 in around 10 meters of water. The serial number was 100913. We did a quick drill with the hydrophone array and recorded the noise of the Gato Verde at 4 knots and varying speeds below as it slowed down. We did a quick man overboard drill with a hockey helmet that we’d found and then spent the early evening learning how to motor around in the dinghy. After a filling dinner, everybody worked through the evening. Peter and Val analysed some of the data we took on the Gato Verde’s noise levels and found some interesting results that will need further experimentation. We’ve had a full, exciting day today, a perfect Beam Reach day. I woke a bit later than usual, rolling out of my sleeping bag at 7:50 and wandering into the kitchen to find that almost everyone had already eaten. Jason and Bubbles, his traveling sourdough starter, had made lovely sourdough pancakes. Our morning meeting turned into an extended, incredibly helpful, strategy session. The conversation, led by Val and Jason, flowed smoothly and ranged from the last bits of research we need to complete for our proposals, to amendments to our data sheets and data collection systems to beginning to practice our analysis. I don’t know about the others but I ended up with two pages of notes and a long list of new things to address or research. 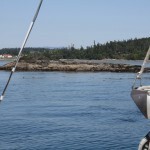 About half way through, we decided to “make like plankton,” drifting from Stuart Island, south down Haro Strait, listening to various hydrophones all the while. We were so engaged that we almost, but only almost, worked past lunch. In the course of “making like plankton” we came across some interest flotsam. I asked for the definition of flotsam while writing this and Val promptly answered, “The things you find at garage sales.” It is actually, Todd tells me, the things you find floating in the water. Anyway, today we came across a hockey helmet, a construction hardhat and a circular piece of polystyrene (Styrofoam). We had an equally busy afternoon, sinking a receiver in front of Val’s house to pick up the pings from transmitters put in salmon. Using an array (pun intended) of ropes, tapes, weights and boats, we managed to sink a cement block attached to the receiver and anchor it to land. As we left, we did a quick drill, pulling out the hydrophone array, as quickly and neatly as possible. We were just beginning to relax again when Todd yelled, “Man overboard!” There was a great deal of running around without a clue where to turn, trying to decide who would keep their finger pointed at the “man” overboard. This was additionally confusing because for the first few seconds, none of us could see what was supposed to be the “man.” Hannah tossed the man overboard pole like a javelin and if it had actually been a person in the water, they probably would have been impaled. The hockey helmet, our “man” was successfully rescued and we proceeded into Mitchell Bay. I had just gone to pull out my laptop and start work on the to-do list I generated this morning when Todd called us together and began dinghy training. Erica and I went first as the night’s cooks. It was like learning how to drive all over again only backwards, all with one hand and out in the wonderful, open blue. The reason I wanted to blog about this day in particular was mainly an idea I had just before dinner while dicing garlic to fry with zucchini. It’s the “Man Overboard” thing. Not only did I feel like today was a bit of a continuous “Man Overboard” drill, in a good, thought-provoking, keep-you-on-your-toes kind of way, but I’ve sort of come to decide that all of Beam Reach is a bit like a “Man Overboard” drill. It presents challenges that are usually unexpected, a bit nerve-wracking, and have an enormous payoff, if successful. All of our Beam Reach overboards seem daunting and confusing at first, but with helpful direction, good judgments, reliable instincts and hard work, we can complete the rescue successfully. Today Val and Scott re-deployed a Vemco VR2 fish tag receiver at Lime Kiln State Park. This receiver, provided for this pilot study to Beam Reach by Fred Goetz, will help marine scientists understand how juvenile and adult salmon use the San Juans, in addition to any other passing fish that have been “tagged” (surgically-implanted) with 69 kHz acoustic tags. We at Beam Reach are most interested in the behavior and distribution of adult Chinook salmon, and secondarily any other potential prey of the endangered southern resident killer whales. The photos above show the mooring prior to being snorkeled down to the pier block that remained from the previous deployment (last November). Two other VR2s have been provided by Kurt Fresh of NOAA. (Their serial numbers are: 100910; 100913.) One will be deployed on the west side of San Juan Island; the other will be placed near Cattle Pass. We’ve mounted them on short (~2.25m) mooring lines (1.25cm diameter 3-strand poly), supported by single yellow shrimp pot floats (see below). The base of the receivers will be ~0.75-1m above the bottom. The floats will be ~1m above the top of the receivers. The mooring weights are either ~25kg concrete slabs (35cm x 35 cm x 15 cm; see below) or paint buckets filled with cement. 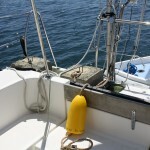 Both types of weights have metal hoops or chain for attaching the mooring line and for lowering during deployments from a boat.